Nevada City is fortunate enough to have the Tahoe National Forest as its back yard. 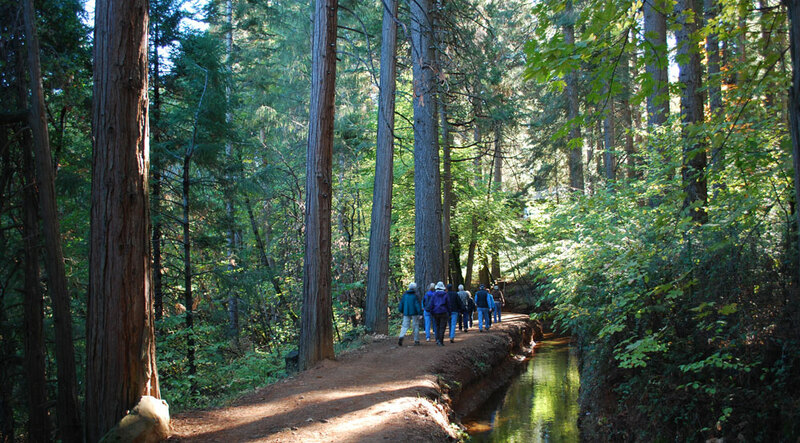 With over 655 miles of accessible trails, numerous State Park, BLM and National Forest camp sites and unlimited lakes, rivers and streams for fishing enthusiasts, Nevada City has become known as “ground-zero” for non-motorized recreational participants. Castle Peak, Grouse Ridge and the Sierra Buttes areas host the Pacific Crest Trail, known to hikers from around the world as the prime hiking route of the western United States. 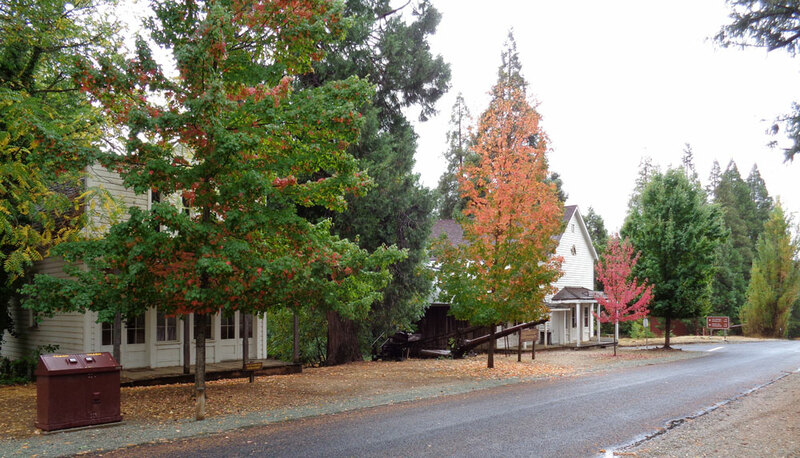 Take a long walk on the trails in and around the historic Gold Rush town of Nevada City. 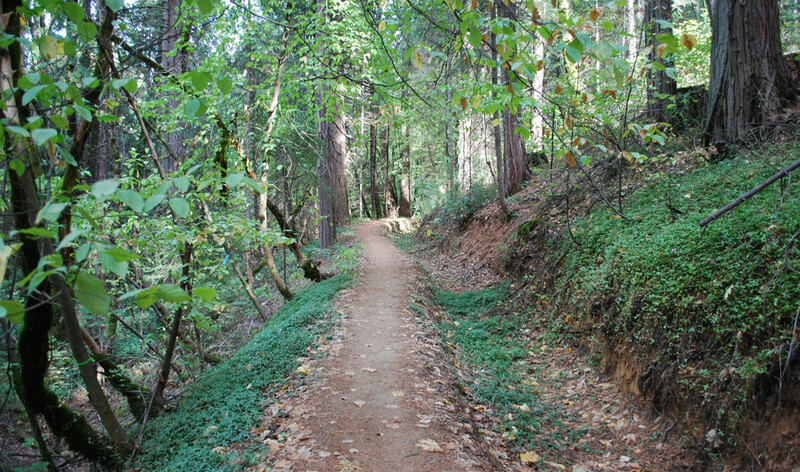 Here is a list of some of our favorite Nevada City Trails, either walkable from downtown or located just a short drive away. The good news with all of these outings is the accessibility to the outdoors and proximity to in-town coffee shops, restaurants, wineries, pubs, art galleries and theaters. Follow each link for maps, detailed descriptions and directions to trailheads. Where to park: Parking lot at trailhead. Directions: Highway 49 to No. Bloomfield Road. Drive eight miles, past the river, follow signs to the campground and trailhead. Historical significance: Trail passes through Gold Rush remains. 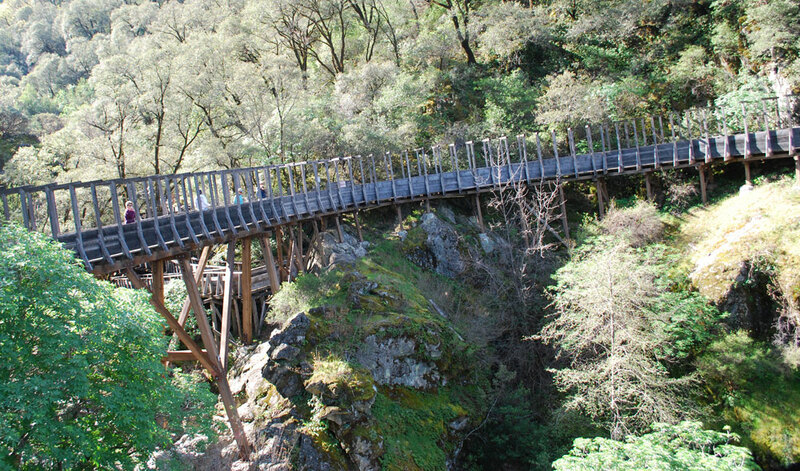 Special features: Trail can also be accessed from Purdon Crossing. Hiking, horseback riding, picnic sites, primitive and maintained camping. Swimming, fishing, nature study. 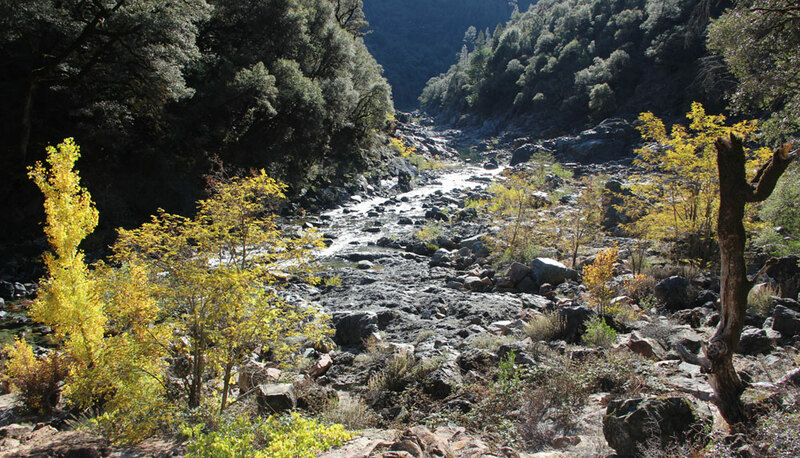 Trailhead: Hike upstream from the trailhead at the South Yuba Campground. To hike downstream, begin at Poorman Creek, two miles downstream from the little town of Washington. Both trails are clearly marked. Where to park: Ample parking at trailheads. 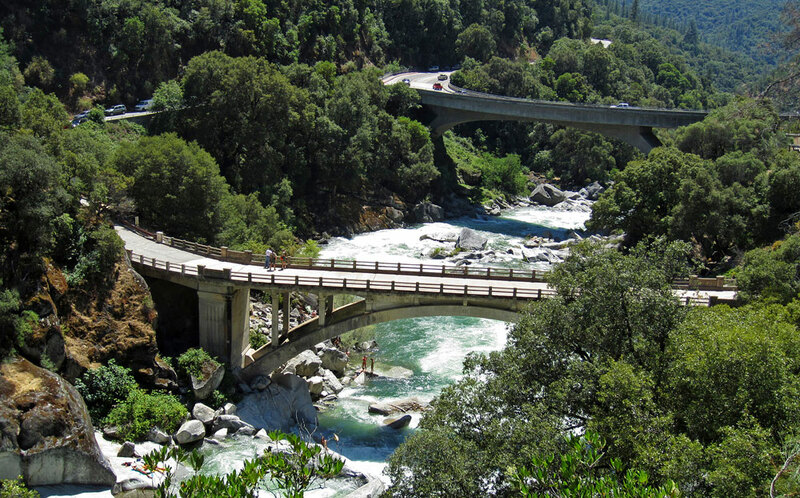 Directions: The South Yuba Campground is reached from Nevada City via North Bloomfield Road to Grizzly Hill Road. Poorman Creek is reached via Highway 20 and Washington Road to the town of Washington. 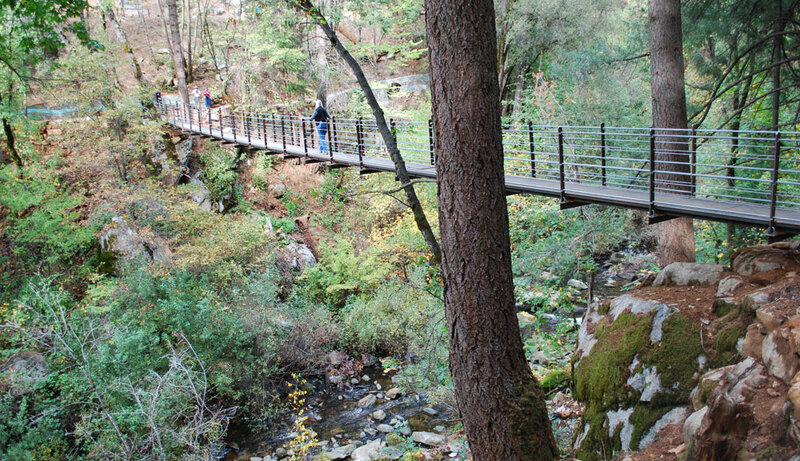 Cross the bridge and follow the signs to the trailhead. 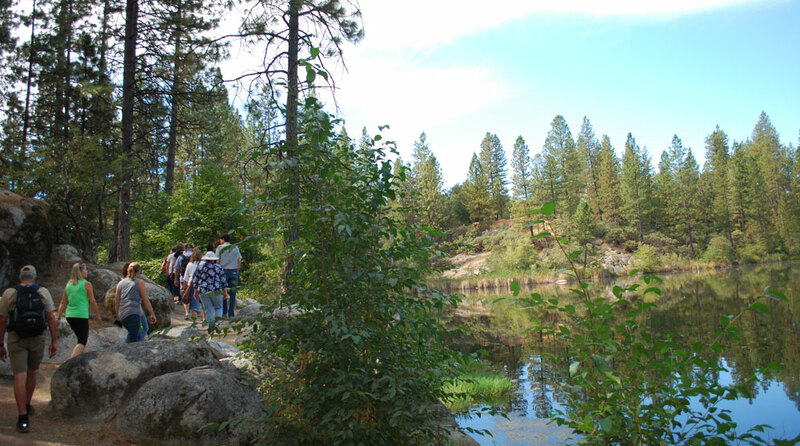 Historical Significance: Thousands of placer miners occupied this area during and after the Gold Rush. Special features: Grand views, huge oaks, beautiful pools and solitude. Trailhead: Off Pleasant Valley Road, upstream of Bridgeport, north side of river. Directions: From Grass Valley, west on Highway 20 to Penn Valley. Right (north) on Pleasant Valley Road, eight miles to Bridgeport. Degree of difficulty: 3. Fairly flat except for one 50-yard upslope. Special features: A favorite wildflower hike in March, April and May. Offers nice views of the river canyon, access to many swimming holes. Literature available at the ranger station. Directions: Exit Highway 49 at Empire Street, drive east one mile to park. Historical significance: Passes many historic mining sites. Special features: Visitors entering through the visitor center must pay admission. Free entry is allowed by parking at the Pennsylvania Gate equestrian staging area.This trail is multi-use, open to hikers, mountain bikers, and equestrians. Dogs must be leashed. Open daily sunrise to sunset. Trail maps are available at park visitor center. Where to Park: Main parking lot (admission charge at Visitor Center) or at Pennsylvania Gate staging area (free entry for hikers). Distance of hike: Approx. 5 miles of connected trails. Special features: Beautiful forest setting, small creek crossing. Trail maps are available at the park visitor center. Trailhead: Highway 174 at Empire Street. Where to park: Empire Street opposite Empire Court, at the Pennsylvania Gate equestrian staging area. Historical significance: Area is peppered with old mine sites and includes the pipeline that brought water to the mines. Special features: Detailed trail maps are available at the park visitor center.